Social media is different from regular advertising. I think we can agree on that. A Facebook page is different from a print campaign in a magazine. A 30-second TV spot is different from a YouTube video interview with someone in the company. The biggest difference is in impressions. Regular advertising gets millions of impressions. Even though people might be reading less magazines, and less newspapers and perhaps watching less TV, one 30-second spot on Glee will get more impressions than ten years of posts on Facebook. So this isn’t a “you should use social media because” post. Traditional media is still critical for getting people to raise their hands. For marketers already engaged in social media, this a primer on how and why it is different. And if you happen to be a content creator that dabbles in both traditional and social media content creation, consider this a short list of things to think about. 1. In traditional media, space is defined by a media owner. In a full-page ad, or a billboard, or a 30-second TV spot, the space is defined by the owner of the media. “Full-page”, “30-second”, etc, these are parameters (or specs). they are standard, and not to be changed (with the exception of adding dimension to billboards to make them stand out). In social or digital media, there aren’t physical parameters. Anyone can create a Wikipedia page, but Wikipedia doesn’t give specs. Anyone can create a Facebook page for your brand. People can and do create Twitter feeds. Implication: The obvious implication is control. A brand is in total control of the space in regular media because it is purchased. Since it is purchase, it is also finite. Social media platforms like Wikipedia, Google+, Facebook, Twitter and YouTube, are different because the space isn’t purchased, and it isn’t finite. The content builds, and therefore, it is critical to take the occasional big picture look at the content. 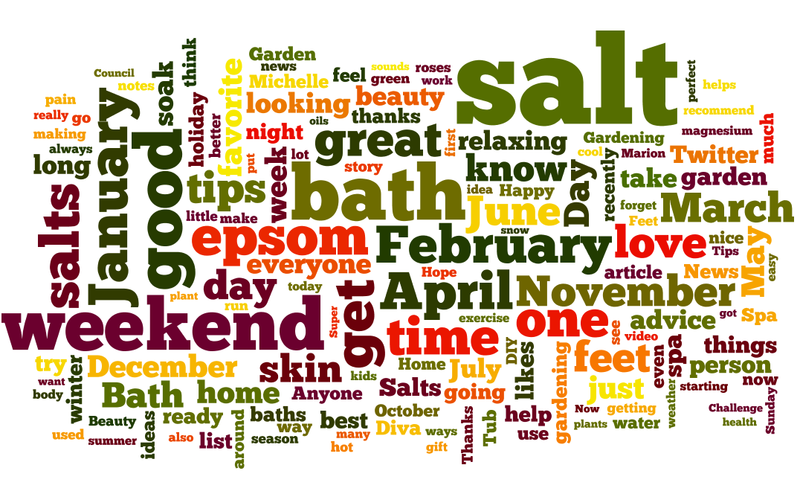 My advice, use a word cloud like Wordle.net to get a look at the big picture of a brand. This is the word cloud for a brand on Facebook. The bigger the word, the more it was used – the dates reflect when something was posted, giving a good look at the content calendar. You don’t need to be an admin to do this. You can do this for any brand! 2. Social media isn’t interruptive. When an agency buys space in a magazine or on a TV show, or whatever, the ad message flows around the content. Step one is interrupting the target market from reading the article. Or the goal is to stop people from flicking the channel or zipping through the commercial with their PVR. Implication: people choose to like, follow and subscribe. All of those things are simply subscription methods, people saying “I want your content”. Now, I’ll agree that more and more, the content from brands is merely clogging our streams, and thus there needs to be an effort to engage instead of advertise, but that is for another point. The point is, people want to hear what a brand has to say. Don’t advertise to them, and quit trying to be clever. 3. Engage and ask questions. Advertising copy is great. It’s designed to interrupt and inform. It’s often well-crafted copy that speaks on many different levels. But people don’t talk like that in real life. And they don’t talk like that in social media. Wordplay works with friends, but rarely with brands (exception, your brand is a cool one). We’ve been trained through texting and Twittering to get to the point. So forget the flowery ad copy and get to the point. Implication: when I was learning to copywrite, a creative director once said to me “never ask a question in an ad”. Period. And if you do in the headline, answer it in the copy. The reason is, you don’t want the consumer to answer it in a negative way. I agree. But in social media, where a brand is supposed to engage, questions are a part of conversation. When my friend comes up to me, they often start with a question: “How was your day?” “What are you drinking?” “Where are your kids?”, etc. Questions start conversations. Statements don’t. 4. Have a response plan. You already have a content plan. That is what you will post and when you will post it. Now you need a response plan. When people begin to respond to questions the brand poses, what are the responses? What, if anything, will you do with great comments? Are great comments ammunition for other marketing? Implication: the response is as important as the content. Really. They are. We put a lot of time into the message of the brand. But the response is just as important. How a brand responds (and how fast) can be just as important as what was said. 5. Other people will create the content. In a print ad or a traditional advertising spend, the brand creates the message. The exception is the annual Doritos Super Bowl ad. We’re all spending more and more time creating content for the brands we love or hate. Implication: listen. Brands are also generating a whole pile of content. The cool implication of social media is you can now listen to what your competitor is saying. You can listen to what people are saying about your competitor. You can listen to what a company in England that sells something like your product is saying to their customers. You can listen to… well, you get the point. 6. We’re still figuring out the contract with the consumer. In paid media, the media buy underwrites the content. We understand that the 30-second spot is partly responsible for the show we are watching. In social media, there is no defined contract. Implication: good question. We’re still coming to terms with it. Brands on Facebook don’t make Facebook freer. Following a brand on Twitter doesn’t make Twitter more free. If Facebook comes begins to charge brands to have Facebook pages in return for giving us free stuff, then maybe that’s the deal. In the meantime, we’re stuck with brands creating a lot of content and not really adding value. Which is why brands should think about adding value before they think about adding content. What do you think of the list? What did I miss? What would you take away? Your article is informative throughout. Advancing with the technology we have around by making best use of it is quite necessary to face the challenges and to grow among the competitors. Social media has a huge value for the business when it is powerfully used. Please keep posting and share your views with us on similar issues.